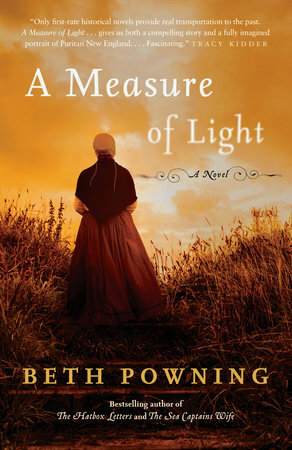 With Beth Powning’s trademark elegance and insight into the hearts and minds of unforgettable women, A Measure of Light brings to life an extraordinary historical figure. Mary Dyer is a seventeenth-century Puritan who flees persecution in England, only to find the colony of Massachusetts Bay as dangerous as the country she left behind. Though she is the wife of a successful merchant and mother to their children, she becomes stigmatized following a birth gone terribly wrong and is reviled as a friend to the infamous heretic Anne Hutchinson. Mary tries to accept New England’s harsh realities, but is out­raged by the cold-hearted Puritan magistrates, with their doctrinaire stranglehold on church and state, their sub­jugation of women, their wars against the natives in the surrounding territories and their vicious treatment of any who challenge their rule. Mary becomes one of America’s first Quakers. As both outcast and privileged citizen, caught between the call­ings of faith and the ambitions of her husband, she comes to the realization that she must follow her convictions in order to bring an end to the brutal repression of the Quakers in Massachusetts, for whom death by hanging is the ultimate punishment. From Mary’s relationship with Anne Hutchinson to her fiery exchanges with the colonial magistrates, A Measure of Light is both a sensitive work of imagi­nation and meticulously true to the historical record. In this exceptional pairing of author and subject, Mary Dyer receives in the hands of Beth Powning— herself a New England–born Quaker—the full-blooded recognition too long denied a woman of her moral stature and significance in shaping American history.